What a weekend! I certainly did anything I thought might be fun or make me smile, and I succeeded for the most part. On Friday, a group of friends and I got together and had a small crafternoon gathering. Nothing big or fancy, just us and some crafting supplies. Every once in a while, my friends and I get together to do a crafternoon. We’ve been doing this for years. It all started in the back room of the movie theatre we worked at together. We decided one summer that we wanted to do themed movie showings and go dressed up. The first crafternoon was a jewellery making one, where we all made “hippy” necklaces. Another one I remember was for the The X Files: I Want to Believe, for which we dressed up in tin foil. Other times, we would go to Walmart and pick up cheap painting supplies and paint on canvas or on wooden toys. We just had a lot of fun. 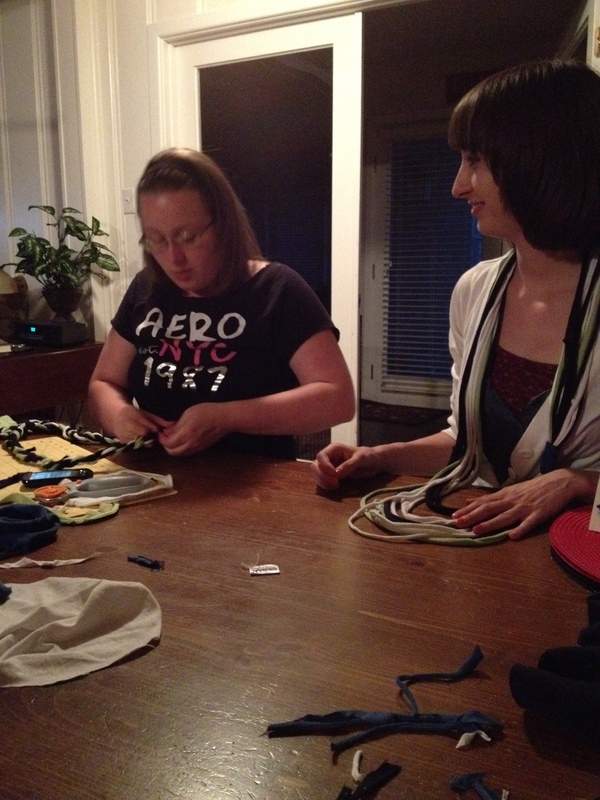 This crafternoon project was t-shirt scarves/necklaces. It’s one of the simplest crafts I know, and after trying to teach them to crochet (I used to be pretty good with the basics, but now I’m rubbish) and failing, I opted for simple. We all brought t-shirts, and my brother Josh and I went to Michael’s to pick up a new rotary wheel, which I’m in love with, and a cutting board, since we forgot mine at the house. Now, you’re supposed to have a whole t-shirt for this project, and one of my friends just brought pieces of a shirt. Luckily, with a little creativity, we … I mean Frances (her crafting alter ego, which happens to be me) was able to pull together a decent looking scarf in the end anyway. 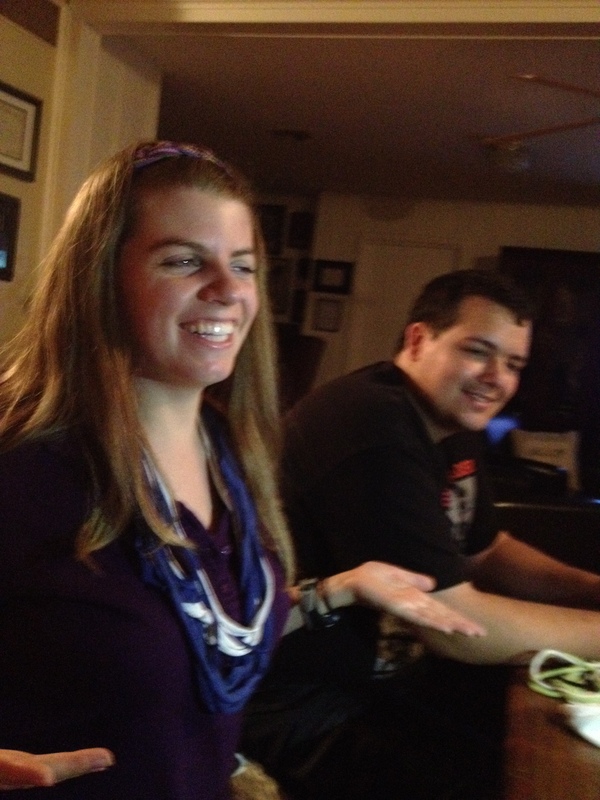 Frances might have helped a couple of others with their projects too, but she’s not spilling. 1. Lay your t-shirt on a cutting board (I know that’s not the right term, but I’m at a loss this morning) and fold it in half. Smooth out all of the wrinkles. 2. With the rotary wheel, cut off the bottom hem. You won’t need this, so toss it to the side. 3. Moving up the body of the t-shirt, cut 1/2 inch strips. They should be loops as you’re cutting through both sides at once. Cut one piece so it’s no longer a loop. 4. When you have all your strips, stretch each strip one at a time until it looks like spaghetti. Don’t be afraid to really have at it. 5. Decide how long you want the scarf to be. I usually double it up (like a long necklace). 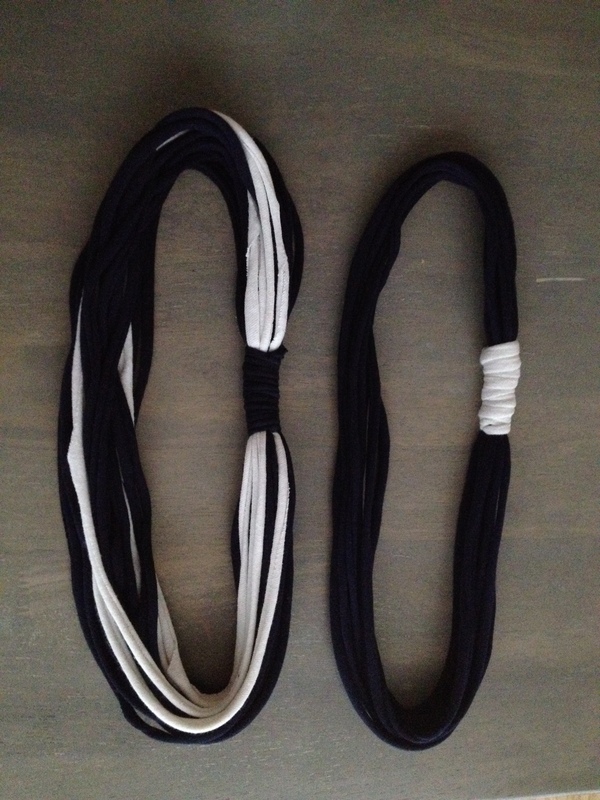 Then, wrap the spare non-loop piece around your bundle of t-shirt loops to hold everything in place. You can tack it if you like, or just tie a really tight knot. If you haven’t tried this craft before, I highly recommend it. It’s very very easy to do. 1. Do not use a stretchy t-shirt. You would think that because you’re stretching the fabric, a stretchy one would be handy. The problem is stretchy bounces back. 2. Do not get too worked up if your strips are uneven. Once you stretch it out into spaghetti, it will be hard to notice. 3. Do not be afraid to really have at those strips. They will hold up for the most part. Any that don’t can be used for other projects, like finger knitting a bracelet. Sounds like a really fun afternoon. what a great way to relax with friends! “Crafternoon” just might be my new favorite word. And I’m ALL about the concept behind it. So, I just might need to pull some friends together to start this tradition, too. Your t-shirt scarves turned out great. That’s one project on my crafty to do list. It’s so much fun! A bit time consuming but well worth it, I think. Love the navy and white together! I think this one will have to go up there on the “must do” list! Which of course is so very long! Mine too! There are so many great crafts to try. I love crafternoons! 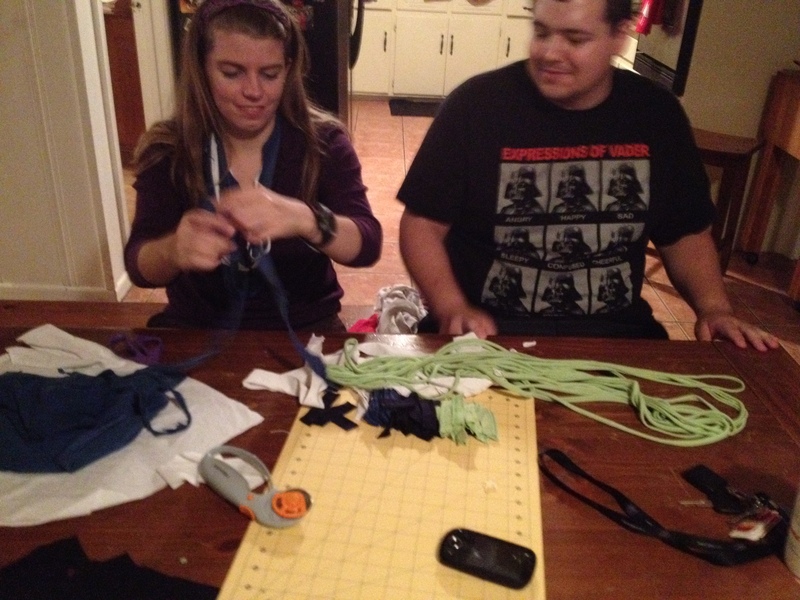 Ours usually aren’t coordinated, but the idea of everyone working on the same thing is great! I think we’ll give it a try. I love the crafternoons! Awesome great scarves. Haha. Crafternoon – totally using that idea. Thanks for the tutorial. It’s so cool seeing what you can do with old t-shirts! So fun! And I love Crafternoon! 🙂 Thank you for stopping by my blog. wow! Who doesn’t have old t-shirts to repurpose!? And, I really like the “crafternoon” idea. Looking forward to seeing what else you are up to. Go for it! 🙂 Crafternoons are free game. We usually do one craft because I’m the main craft person, but that does sound like a fun evening. I love the movie themed costumes! Sounds just like my friends and I! Fun! Hi, thank you for dropping by and liking the thefetes post with the flip flotsam vid! We crafternoon for our school fete and our local neighbourhood has a craft group which meets about once a month – not for a crafternoon but a more drinkies-friendly, kids-in-bed evening craft, with a glass of wine and a good natter! A nice, crafty way to get together with friends! Thanks too for visiting my blog. Great! I’ll have to institute my own crafternoon! Thank you for stopping by my blog, too! I love making my own scarfs. I am wearing one today when I go to town. I am going to try and do this type you have shown here also. I could not resit this post when I saw the scarf tutorial. Thanks so much for visiting my blog and liking: http://blueribbonfair.wordpress.com/2013/02/26/tweed-and-velvet-pinafore/ I love that dress made at: fabricmagpie. I love the idea of a “crafternoon”! Thank you dropping by my blog. I think knitting is great; but my daughter is the great knitter in my family. Your scarves look fun and it looks like you have a great support for knitting. Reblogged this on CULINARY KNOWLEDGE. Love the t shirt scarf idea! Great idea on how to re-purpose an old T-shirt! Thanks for stopping by my blog. Yours is wonderful. Love this! A T-shirt scarf is next on my list ‘to do’! I’d better get my scissors ready to shred away, lol…. I NEED to try this!!! When I do can I put it on my blog? Definitely! I’d love to see it! What a totally inspirational blog, and it certainly gets my word of the day vote! Crafternoon – just brilliant. Thanks for visiting my blog – Time to take on Guerrilla Knitting. I was so pleased to discover yours in return. Great idea, reblogged your link on my blog. Used your image too, credited. Hope you don’t mind. It’s always a worry when I use someone’s image before permission is granted. I had one blogger get right snotty about it, so I removed their image and all reference to them in very generous post; their problem. An afternoon crafting with friends! Dreamy. And I love the scarves. After a winter of wool I am finding soft cotton so welcome. I will have to try these. This is awesome! I love wearing scarves : ) I will definitley being trying this. Fab! Thanks for the inspiration! Oh thank you so much for noting to use non-stretchy tshirts! I tried this once, and the strands kept curling up – congrats on a great project!